The Tara temple in Tarapith steeped in the narrated myths is a medium sized temple in the rural precincts of Bengal. Its fame as a pilgrimage centre with the deity of Tara enshrined in it is due to "the temple’s founding myths, its type of worship (which includes blood offerings), the hymns sung there, the powers of the nearby tank, and the inhabitants and rituals of the adjacent cremation ground". 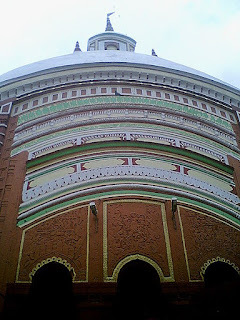 The temple base is thick with thick walls, built of red brick. The superstructure has covered passages with many arches raising to the pinnacle with a spire (shikara). The image of the deity is enshrined under the eaves in the sanctum. There are two Tara images in the sanctum. The stone image of Tara depicted as a mother suckling Shiva – the "primordial image" (seen in the inset of the fierce form of the image of Tara) is camouflaged by a three feet metal image, that the devotee normally seen. It represents Tara in her fiery form with four arms, wearing a garland of skulls and a protruding tongue. Crowned with a silver crown and with flowing hair, the outer image wrapped in a sari and decked in marigold garlands with a silver umbrella over its head. The forehead of the metal image is adorned with red kumkum (vermilion). Priests take a speck of this kumkum and apply it on the foreheads of the devotees as a mark of Tara's blessings. The devotees offer coconuts, bananas and silk saris, and unusually bottles of whisky. The primordial image of Tara has been described as a "dramatic Hindu image of Tara’s gentler aspect". The priests of the temple offer puja (worship) with great reverence to bring out her motherly aspect to the devotees, blending the North Indian fierce depiction of the Sati myth of the goddess with the peaceful motherly visionary form of Tara seen by Buddha and his disciple Vasishtha of the Tantric tradition – the Buddhist Tara form.At Tarapith, though the softer motherly aspect of the fierce goddess is emphasized. Chanting hymns or poems in her praise is also a part of the devotional appeal made to the goddess. The devotees take a holy bath at the sacred tank adjacent to the temple before entering the temple premises to offer worship and even after the worship. The waters of the tank are said to have healing powers and even restore life to the dead. Blood sacrifice of goats is the daily norm in the temple. Devotees who offer such goat sacrifices seek blessings from the deity. They bathe the goats in the holy tank near the temple before the sacrifice. They also purify themselves by taking bath in the holy tank before offering worship to the deity. The goat is then tethered to a stake, the designated post in a sand pit, and the neck of the goat butchered with a single stroke by a special sword. A small quantity of the blood of the goat is then collected in a vessel and offered to the deity in the temple. The devotees also smear their forehead with a bit of blood from the pit, as a mark of reverence to the deity.